Doves of Peace soar above a mystical Jerusalem. Here day and night exist in perfect balance as loving couples wander hand-in-hand along twin paths towards a star-lit ocean and a sun-drenched city, perched atop gentle hills. 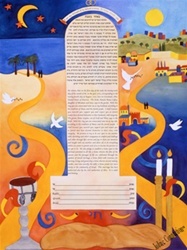 Crowning this paradise are two interlocked wedding rings and a scroll which reads, “I am my beloved’s and my beloved is mine” (Song of Songs). Below, twin shofars proclaim the word “Chai” (life) while candles, wine and challah stand as symbols of the Jewish home.